The Long-tailed Ground-Roller is quite rare, but our local guide, Fredi, and his crew, were able to find this one and carefully move it towards us, so we got amazing views. Photo by participant Linda Nuttall. This was my ninth Field Guides Madagascar tour (eleventh overall), and was again a terrific trip with a very congenial fit group who were also very good at spotting. I have gradually fine-tuned this tour to eliminate as many Madagascar Air flights as possible, and we enjoyed close to an ideal itinerary this year. Very dry conditions at Ranomafana certainly depressed some small bird activity, but we had a very good range of species overall and great views of some very special mammals like sifakas, Indri, mouse-lemurs, bamboo-lemurs and woolly lemurs, not to forget non-venomous snakes, day-geckoes, skinks and chameleons as well. We drove to Ambositre on the first day, stopping at a small marsh where Madagascar Snipe and a bonus Painted Snipe showed well and a Baillon's Crake made a fleeting appearance. Next day was across to Ranomafana, seeing Madagascar Flufftail at a marsh stop en route and getting to the lodge in time for a late lunch. This park is always a highlight but is also the most physically demanding part of the tour, with a couple of hikes that can take most of the morning and involve a bit of up and down, though nothing too strenuous. The rewards are great, with Pitta-like Ground-Roller showing amazingly well, and Velvet Asity seen a couple of times. Rufous-headed Ground-Roller was eventually heard and seen briefly by some, we saw the rare Pollen's Vanga, good looks at Crossley's Vanga and a lucky pick-up of both Madagascar Yellowbrow and Brown Emutail late one afternoon, the first couas in Red-fronted and Blue, and the introduction to the wonderful lemurs, with Golden Bamboo Lemur, Fat-tailed Dwarf Lemur and Milne-Edward's Sifaka. After Ranomafana we headed south, stopping at the Ambalavao artisan silk making co-operative and the local paper-making enterprise before our new site for Ring-tailed Lemur. This proved to be great; the animals are in very fine condition and we encountered some 3 large groups for great looks. This site is looked after by the local villages, so the money goes back to the community not so some expatriate overlord as at Berenty. 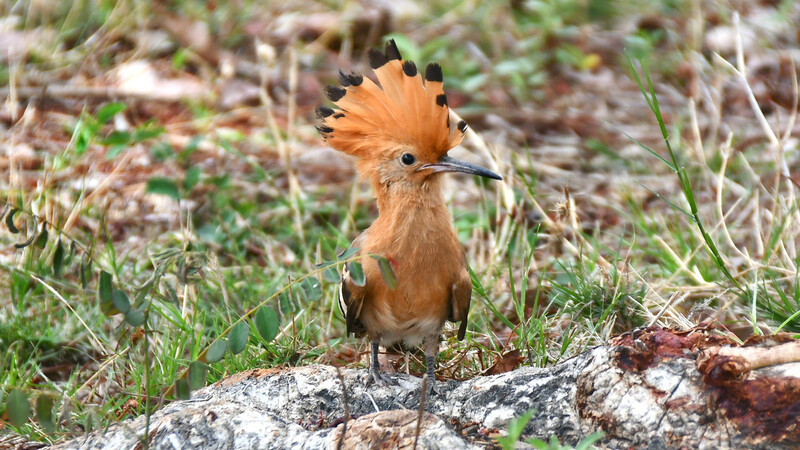 Arrival at the beautiful Jardin du Roy was at dusk and we had the next day to explore the attractive sandstone and grassland surroundings, seeing Benson's Rock-thrush, Madagascar Hoopoe and a brief encounter with Madagascar Partridge. Suitably rested, we drove two hours south to the precious forest fragment at Zombitse in the sapphire mining area, where Giant Coua and Cuckoo-Roller showed beautifully, two White-browed Owls were surprised to see us, and the attractive Verreaux's Sifaka and Zombitse Sportive-Lemur showed well. The local guides came up with the rare Appert's Tetraka too, one of the most range restricted species on earth. On then via Tulear to the coast at Ifaty, seeing some migrant shorebirds en route as well as the Madagascar form of Three-banded Plover and Kittlitz's Plover with a juvenile. Our time in Ifaty was focused on the legendary spiny forest, and we spent most of our birding time in the eponymous Parc Mosa. Our guides here were Mosa's son Fredi, and his nephews Dedi and Rofia, and they were fantastic at pulling every last bird out of the inhospitable-looking spiny forest, from megas like Long-tailed Ground-Roller, and Subdesert Mesite, to the tricky and secretive Thamnornis, and even a bonus Madagascar Sparrowhawk nest. The forest also produced Archbold’s Newtonia, Lafresnaye’s Vanga, and both Crested and Running Couas. Nearby, we had good looks at Madagascar Plover with a juvenile, and a surprise Caspian Tern. The Bamboo Club itself was good for some dusk views of Madagascar Nightjar feeding or drinking over the pool. Our second afternoon was set aside for a targeted visit to the amazing arid dense thorny vegetation at La Table, where we were able to track down both Green-capped and the rare Verreaux’s Coua, and where Fredi did an amazing job of finding an astonishingly confiding male Red-shouldered Vanga. Both of these latter species have tiny worldwide ranges, and it was great to connect with them both. Our boat trip out to Nosy Ve took place in thankfully calm conditions, with wonderful views of Crab-plover and the gorgeous Red-tailed Tropicbird, which was new for most folks, and Littoral Rock-thrush at Anakau also showed nicely, even with a female this year. We got back in good time for lunch then our flight to Tana was uneventful; having just two Mad Air flights on the tour is such a relief after the tribulations of previous years! Driving up to Ankarafantsika, we encountered a bonus Malagasy Harrier and our first Madagascar Pratincoles on the Betsiboka River. We were based at the park, and met up with our excellent local guide, arriving just before a heavy storm hit. A short night walk dodged the tempest and got us Golden-brown Mouse-Lemur, Fat-tailed Dwarf-Lemur and Oustalet's Chameleon, plus several of the scarce Rhinoceros Chameleons. The following day, we had a mission to see all of the local special species. 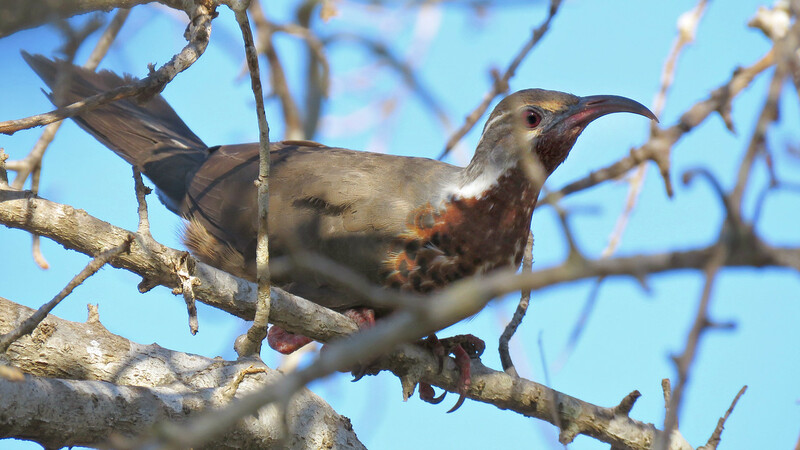 We began very well with a newly discovered nest of Schlegel's Asity, then after breakfast some first-rate spectacular views of duetting White-breasted Mesite, and eventually 2 separate splendid Van Dam's Vanga -- a rare species that is easily missed. Coquerel's and Red-capped couas showed well too, as did Madagascar Green Pigeon. Milne-Edward's Sportive-Lemur was a good find, peeking out of a crack in a hollow tree, then we managed two Madagascar Fish-Eagles soaring over the lake. The Madagascar Jacana was proving recalcitrant this year, but our guide knew of a site and we backtracked to a marsh where we found this rare species plus our first Humblot's Heron and a bonus of Harlequin Quail. The Betsiboka estuary boat trip worked like a charm this year with a foray out at first light and back by 0930, with calm seas, the tide rising and just right for great looks at a couple of the rare and very distinctive "Malagasy" Sacred Ibis (split by the IOC and HBW/BirdLife checklists), plus a bonus of 7 Crab-plovers. Back then on an uneventful lunch time flight to Tana, with a night at the Tamboho before splitting up into two SUVs for the eastern leg of the tour. As we drove east, we stopped for good views of Madagascar Pratincole once more. World famous Andasibe (also known as Perinet in the old days) was the focal destination, and our hotel for some 4 nights was the incomparable Feon N'y Ala (which translates to “song of the forest”, referring to the haunting vocalizations of the Indri) nestled in at the very edge of this wonderful native forest. True to its name our home base gave us daily hearings of their wonderful calls, one of the most evocative of all Madagascar sounds. We had a full morning each at the Mantadia and Andasibe units of the National Park, and we experienced some truly special birds- Scaly Ground-Roller, Short-legged Ground-Roller, Nuthatch Vanga, Malagasy Spinetail, Madagascar Wood-Rail and Madagascar Long-eared and Madagascar Scops Owl. In addition to Indri, our other non-birds included some Common Brown Lemurs and an amazing Giant Leaf-tailed Gecko plus an assortment of chameleons. We then packed up and headed east, with our next target being the legendary Aye-Aye, a bizarre creature that makes you wonder if it was George Lucas’s inspiration for Yoda. A half-day drive to the coast included a couple of rest stops, and during both of these we had the phenomenon of very vocal Madagascar Pratincoles flying around these small towns, right over our heads, and then landing on top of buildings. They were apparently nesting on some of the nearby roofs, and we got to see some of their excellent display flights. We eventually made it to the coast, and got on our boat. Our boat ride took us through the Canal of Pangalanes, and to the resort, where we had a delightful lunch, followed by an interesting walk around the island with our resort guide. We also got a great rundown on how vanilla is produced on such a grand scale in Madagascar (it’s exceptionally labor intensive). Many of the tame lemurs came and had a look at us and we got climbed on by Black Lemurs and hybrid Red-fronted Brown x Black lemurs. They are amazingly well-mannered (totally unlike monkeys which I definitely would not have climbing on me! ), have very soft paws, and weigh less than 4 kg (10 lbs), a nice encounter. 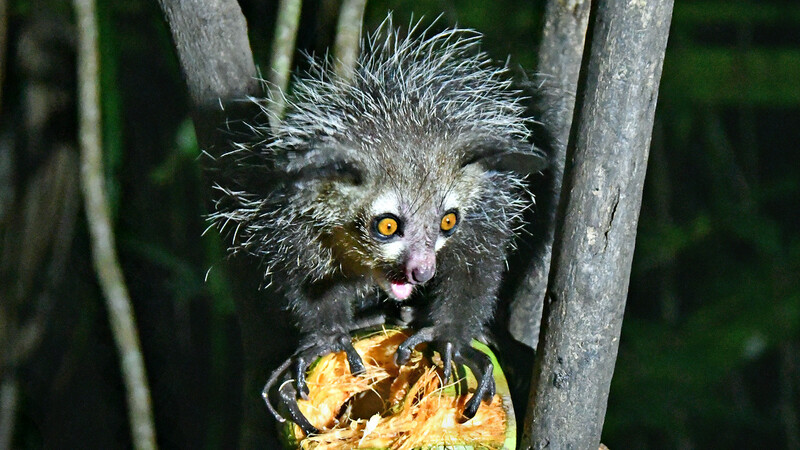 We then headed out to see the Aye-Aye, seeing one as soon as we got into the forest whilst it was still quite light, and eventually had encounters with some four individuals at the viewing site. Watching these pre-historic looking mammals devour coconuts with the help of their long, thin middle fingers was a huge highlight for everyone. This year we reverted to our usual Mauritius and Reunion extension. The afternoon departure from Tana on Air Mauritius was uneventful and we got to our hotel at Flic en Flac around 0930 pm, where they had kindly kept the buffet for us. Our day around Mauritius was excellent despite some heavy showers which we dodged very nicely. We picked up the big three very quickly, with great views of Mauritius Parakeet, Pink Pigeon, and Mauritius Kestrel at our usual site. Trying for Mauritius Cuckooshrike proved hopeless, but we saw Mauritius Bulbul at 3 sites, a valuable addition of a sometimes tough species. The short boat trip to Ile aux Aigrettes sanctuary was really good this time, and we enjoyed great looks at Mauritius Fody, close Mauritius Olive White-eyes and a wonderful 105-year-old 200 kg adult male Aldabra Giant Tortoise, plus some of the rare Telfair's Skinks. A fine addition to the trip and well worth the effort. Reunion this year proved problematic due to riots over fuel prices and the cost of living; we got caught up in traffic so could not make a sortie up into the hills, but did manage an excellent sea-watch near St Denis which gave great looks at Barau's Petrels and Tropical Shearwater, plus what proved to be a pale morph Wedge-tailed Shearwater flying like a Pterodroma! Next day we were advised to leave at 0430 for the airport due to likely roadblocks, so our birding on this sector was very curtailed, though everyone took it in good part and was happy to make their rescheduled and now much earlier flights! Nov 6 Tana to Ambositre via Ambatofotsy and Antsirabe. Nov 7 Ambositre to Ranomafana, roadside birding pm. Nov 8 Ranomafana Bamboo lemur circuit and Bellevue, pm Vohiparara and mouse-lemurs. Nov 9 Vohiparara Trail am and pm. Nov 10 Ranomafana to Finanarantsoa, Ambalavaosilk making then then Ring-tailed lemur reserve and early evening at Jardin du Roy at Isalo. Nov 13 Parc Mosa 0545-0930, and Mangily salines, spiny forest 1600-1800. Nov 14 Ifaty to Tulear depart 1400, La Table 1545-1745. Nov 16 Leave for Ankarafantsika by road at 0730, overnight at the National Park. Sun Nov 17 Ankarafantsika area and Lac Ravelobe then to Mahajunga. Nov 18 Mahajunga and Betsiboka estuary early am leave 0730 and back by 0900. Flight to Tana mid-day. Wed Nov 28 Early departure to airport on Reunion, then assorted departures home. 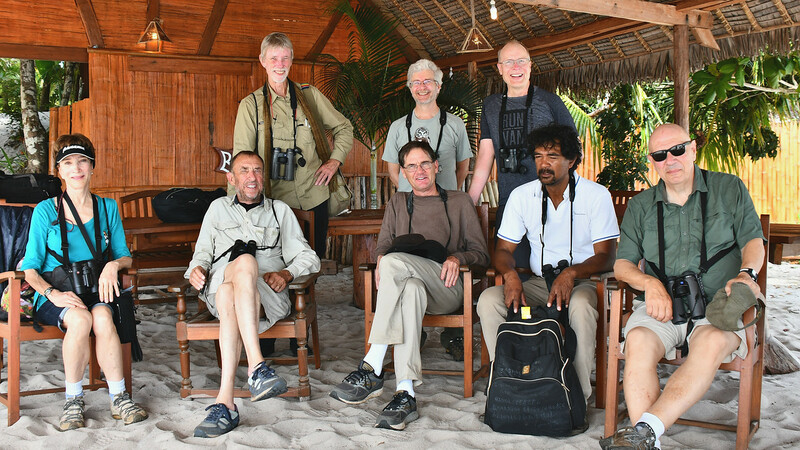 Particular thanks to the brilliant Gerard, our long-time local fixer and birder, and to the various hard-working, skilled and entertaining local guides: Jean-Cris, Zo and Baku at Ranomafana, Randria and Andry at Zombitse, Fredi, Dedi and Rofia the 3 beagles at the spiny forest, Fredi at La Table, Ndrema at Ankarafantsika and the incomparable Nestor at Andasibe. For the extension there was also Jean-Claude on Mauritius and Fred (albeit briefly!) on Reunion. Special thanks to Sharon in the Field Guides office for good logistics on such a complex and difficult itinerary. I enjoyed sharing all these wonderful sightings in Madagascar and the Mascarenes with you, and look forward to another chance to do the same in another part of the world. Safe travels, good birding, and the best for 2019 to you all! A favorite bird of the trip was the White-breasted Mesite, and no wonder, since they performed so well for us. Guide Phil Gregory captured this wonderful video of a pair duetting at Ankarafantsika. WHITE-FACED WHISTLING-DUCK (Dendrocygna viduata) – Small numbers at several sites, with most at Lac Alarobia. COMB DUCK (OLD WORLD) (Sarkidiornis melanotos melanotos) – A single male at Lac Alarobia was a good trip tick; this species is rare on the tour. AFRICAN PYGMY-GOOSE (Nettapus auritus) – The last species of waterfowl that we added to the trip list. We had 11 of these charismatic birds at the extensive marsh at Ambondromamy, for excellent scope views. HOTTENTOT TEAL (Spatula hottentota) – Just two at the Tamboho marsh this year, and half a dozen at Lac Alarobia, less than usual. RED-BILLED DUCK (Anas erythrorhyncha) – Small numbers at most wetlands, with a big flock of 150 at Ambatofotsy on the first day. HARLEQUIN QUAIL (Coturnix delegorguei) – Our foray after Madagascar Jacana saw us also tramp through the rough grass nearby, flushing some 4 Harlequin Quail as our reward. This looks to be a regular site for it, one we found just last year. Our trip to Aye-aye Island provided us with great looks at this bizarre mammal. Photo by participant Linda Nuttall. NAMAQUA DOVE (Oena capensis aliena) – Good views of the drier areas, starting at Isalo. 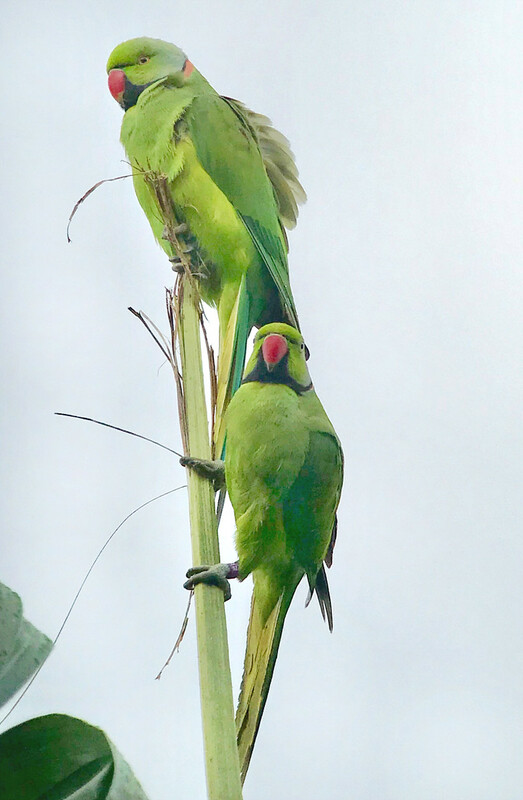 The Echo Parakeet, found on the Mauritius extension, is making a comeback thanks to conservation efforts. We saw these lovely birds at a feeding site. Photo by participant Marshall Dahl. BAILLON'S CRAKE (Zapornia pusilla) – A single, skulking in the reeds at Ambatofotsy marsh, was a lucky find as we have only seen this once before on the tour. MASCARENE SWIFTLET (Aerodramus francicus) – Good views of small numbers on Mauritius. ALPINE SWIFT (Apus melba willsi) – John found us one over a small town en route to Ankarafantsika; this is an endemic race. AFRICAN PALM-SWIFT (MADAGASCAR) (Cypsiurus parvus gracilis) – Widespread in small numbers, the most at Ranomafana and Mahajunga. They were nesting in the palms at the Centr'est. MADAGASCAR WOOD-RAIL (Canirallus kioloides kioloides) – Seen briefly at Ranomafana, then much better one afternoon at Andasibe, where one flew up and perched in a tree. 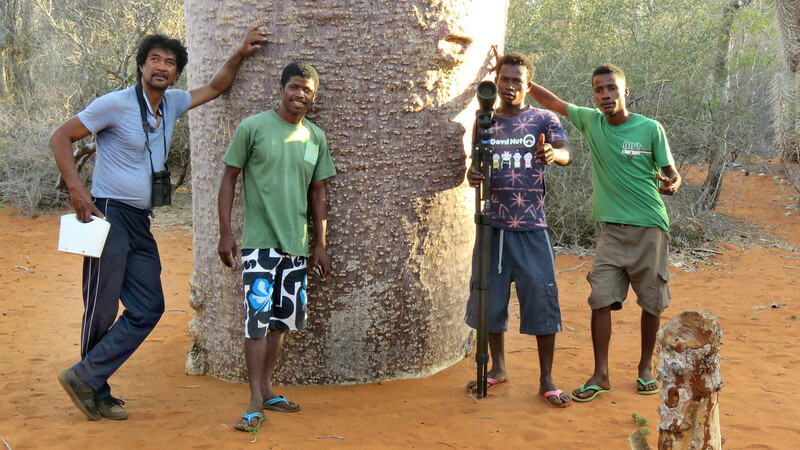 Our driver, Gerard, poses with local guides Fredi, Dedi and Rofia in the spiny forest at Parc Mosa. Photo by guide Phil Gregory. WHITE-THROATED RAIL (Dryolimnas cuvieri cuvieri) – Heard at various wetland sites, a bird showed really well at Lac Alarobia, and another was bathing at Feon N'y Ala, this is a big and striking species. EURASIAN MOORHEN (Gallinula chloropus pyrrhorrhoa) – Seen at Lac Alarobia and the marsh by the Tamboho. BLACK-WINGED STILT (Himantopus himantopus) – A pair with a juvenile at the lagoon near Tulear, then 2 near Ifaty and 3 at Mangily later. BLACK-BELLIED PLOVER (Pluvialis squatarola) – 16 at Tsingotelo and 4 on Nosy Ve, then 3 on the Betsiboka boat trip. GREATER SAND-PLOVER (Charadrius leschenaultii) – 2 at Tsingotelo, 5 at Betsiboka and one on a sandbar at the Pangalanes. KITTLITZ'S PLOVER (Charadrius pecuarius) – 8 at the lagoon near Ifaty with a tiny juvenile seen, and a single later. COMMON RINGED PLOVER (Charadrius hiaticula) – 5 on the lagoon near Ifaty and a couple of singles later in the trip. THREE-BANDED PLOVER (MADAGASCAR) (Charadrius tricollaris bifrontatus) – One at Ambatofotsy and one at a lagoon near Ifaty, and some saw it at the Tamboho marsh. Interestingly, this taxon is rather different to African birds, with a greyish not white forehead, and it is split by the latest HBW/BirdLife review as Madagascar Three­-banded Plover, C. bifrontatus. Note the Sinclair & Langrand guide depicts the white forehead of the African race! 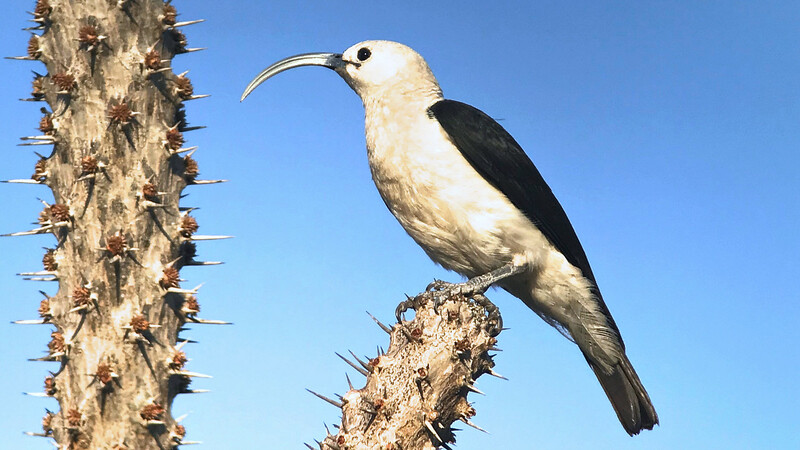 This Sickle-billed Vanga perched on a spiny plant for participant Marshall Dahl. WHITE-FRONTED PLOVER (Charadrius marginatus tenellus) – Three on a lagoon near Ifaty, one at the salines at Mangily and 2 on Nosy Ve. GREATER PAINTED-SNIPE (Rostratula benghalensis) – A male flushed a couple of times at Ambatofotsy marsh. WHIMBREL (EUROPEAN) (Numenius phaeopus phaeopus) – Scarce this year, we saw small numbers at Tsingotelo and at Betsiboka. There were also two probable Eurasian Curlew there, I should have got the boat to go back to check properly! RUDDY TURNSTONE (Arenaria interpres) – Two day records, with one at Tsingotelo and then 4 at Nosy Ve. CURLEW SANDPIPER (Calidris ferruginea) – 11 on the lagoon near Tulear and 5 closer to Ifaty, now sadly an Endangered species due to habitat loss and hunting. SANDERLING (Calidris alba) – 12 at Tsingotelo and 4 on Nosy Ve; always a nice bird to see. TEREK SANDPIPER (Xenus cinereus) – Just a couple on the Betsiboka boat trip, the upturned bill, orange legs and dashing behaviour very distinctive. COMMON SANDPIPER (Actitis hypoleucos) – Small numbers, with 3 at Tsingotelo mangroves the most. We had a good encounter with 6 Madagascar Hoopoes at Jardin du Roy. Participant Linda Nuttall got this lovely portrait of one of them on the hotel grounds. COMMON GREENSHANK (Tringa nebularia) – One at Ambatofotsy, then 15 at Tsingotelo and 20 on the Betsiboka boat trip. CRAB-PLOVER (Dromas ardeola) – 27 on the beach at Nosy Ve, and 7 on the Betsiboka mudflats with 4 flying by earlier. It is always great to see this odd species, which is a monotypic family as well. 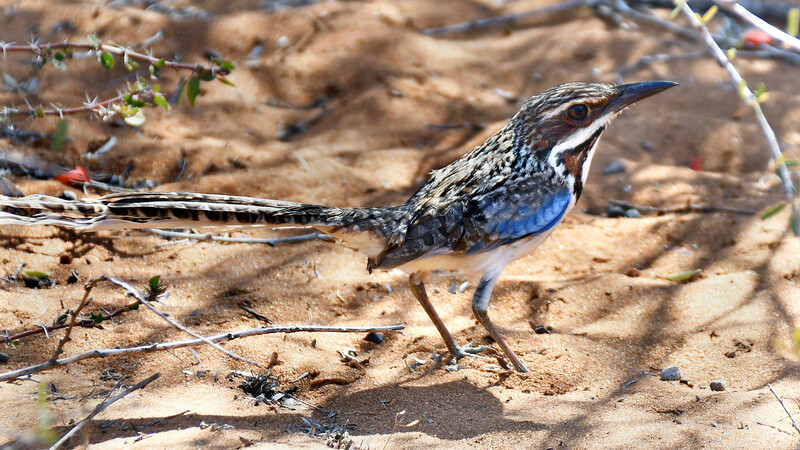 This extraordinary bird breeds in burrows on desolate islands in the Red Sea and migrates down the coast of E Africa. BRIDLED TERN (Onychoprion anaethetus) – Small numbers off Flic en Flac on Mauritius. SAUNDERS'S TERN (Sternula saundersi) – A couple seen in the Betsiboka estuary, tiny and with a grey rump and tail. CASPIAN TERN (Hydroprogne caspia) – A single over a saltpan at Mangily was a surprise, this is not seen on most tours. COMMON TERN (Sterna hirundo) – Small numbers at Tsingotelo near Ifaty. GREAT CRESTED TERN (Thalasseus bergii) – A couple at Tsingotelo near Ifaty, with the typical greenish-yellow bill, and 6 at Betsiboka. LESSER CRESTED TERN (Thalasseus bengalensis) – Good looks at 20 at Nosy Ve; the orange bill is quite distinctive and reminiscent of Elegant Tern. 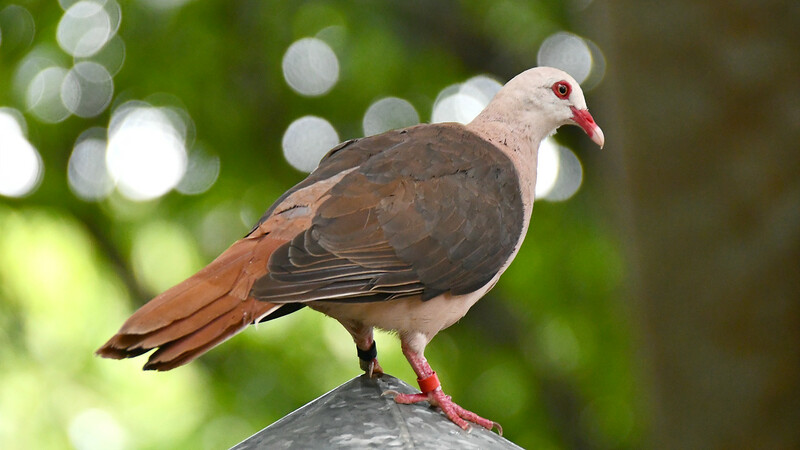 The Pink Pigeon is another species making a comeback on Mauritius. We were able to see them quite well at Bel Ombre and at Petrin. Photo by participant Linda Nuttall. WHITE-TAILED TROPICBIRD (INDIAN OCEAN) (Phaethon lepturus lepturus) – Nice looks at Bel Ombre on Mauritius with 4 birds hawking over the cane fields. RED-TAILED TROPICBIRD (Phaethon rubricauda rubricauda) – A trip highlight was the visit to the small nesting colony on Nosy Ve, where we had lovely looks at them in flight and saw one come in to land and go to its nest under a dense bush. A terrific experience. WEDGE-TAILED SHEARWATER (Ardenna pacifica) – Good looks at some dark morph birds off Flic en Flac beach, then a striking pale morph bird off Barachois on Reunion that was flying quite like a Pterodroma some of the time! TROPICAL SHEARWATER (MASCARENE) (Puffinus bailloni bailloni) – My best ever views of this small black and white shearwater, with at least 10 seen off Barachois, some quite close in for once so we could see the white undertail coverts. A lifer for most folks and a nice save given our lack of birding time on Reunion this year. HAMERKOP (Scopus umbretta umbretta) – Very few again this trip, all singles out in rice paddies with just 4 day records. GRAY HERON (MALAGASY) (Ardea cinerea firasa) – Two at Tsingotelo and one there next day; this is an endemic race and is quite scarce. PURPLE HERON (PURPLE) (Ardea purpurea madagascariensis) – 5 day records of singles, the first being from Tsingotelo, another scarce endemic race. GREAT EGRET (AFRICAN) (Ardea alba melanorhynchos) – Widespread in very small numbers. 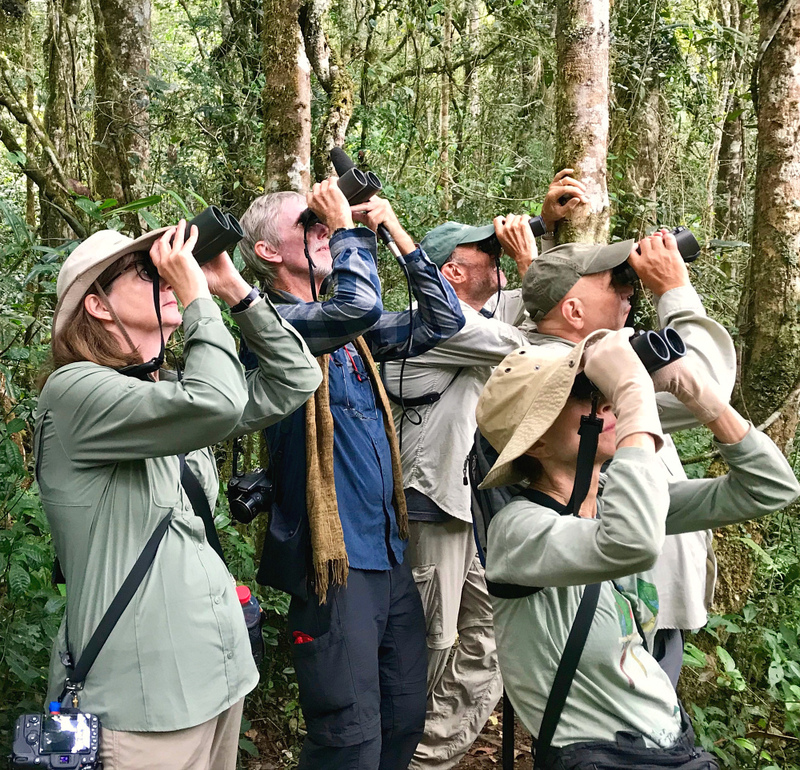 Participant Marshall Dahl got this wonderful shot of the group deeply engrossed in searching for the next rare bird. LITTLE EGRET (DIMORPHIC) (Egretta garzetta dimorpha) – Also widespread in small numbers, with a breeding colony en route to Ranomafana. Around 70 dark morph birds were seen on the Betsiboka boat trip, then about 130 white morph at Lac Alarobia where they are nesting. IOC split this as Dimorphic Egret but the taxonomy remains vexed. BLACK HERON (Egretta ardesiaca) – Worryingly scarce, we saw one wing-spreading at Ankarafantsika, then just a single at Lac Alarobia. CATTLE EGRET (WESTERN) (Bubulcus ibis ibis) – Very small numbers, the only concentration being the colony at Lac Alarobia. SQUACCO HERON (Ardeola ralloides) – A very good count of 180+ at Lac Alarobia where they are nesting, with begging juveniles harassing the parents. Also 10 at Ankarafantsika and 20 at Ambomdromamy marsh. STRIATED HERON (OLD WORLD) (Butorides striata rutenbergi) – Widespread in very small numbers, with a single also being seen on Mauritius near Ile aux aigrettes. BLACK-CROWNED NIGHT-HERON (Nycticorax nycticorax) – 20 at Lac Alarobia and odd sightings at other wetlands late in the day. GLOSSY IBIS (Plegadis falcinellus) – Just 3 at the lake at Ankarafantsika. BLACK KITE (YELLOW-BILLED) (Milvus migrans parasitus) – Widespread in small numbers, many checklists split this as Yellow-billed Kite. 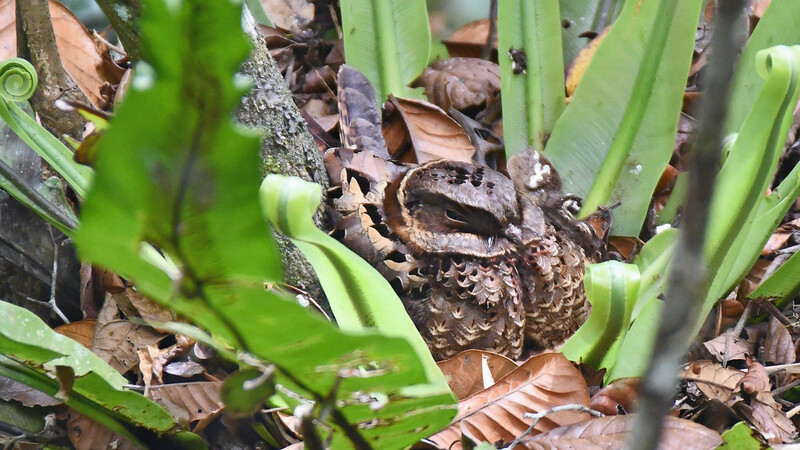 This beautiful Collared Nightjar was nesting in a small fern at Andasibe. Photo by participant Linda Nuttall. BARN OWL (Tyto alba) – Linda and Mark saw one fly past at the Carlton one night, and what sounds like it could be another on a verge near Isalo at dusk. CUCKOO-ROLLER (Leptosomus discolor) – This is a very special bird, a very ancient lineage with no known close relatives, comprising its very own order and monotypic family, Leptosomidae! 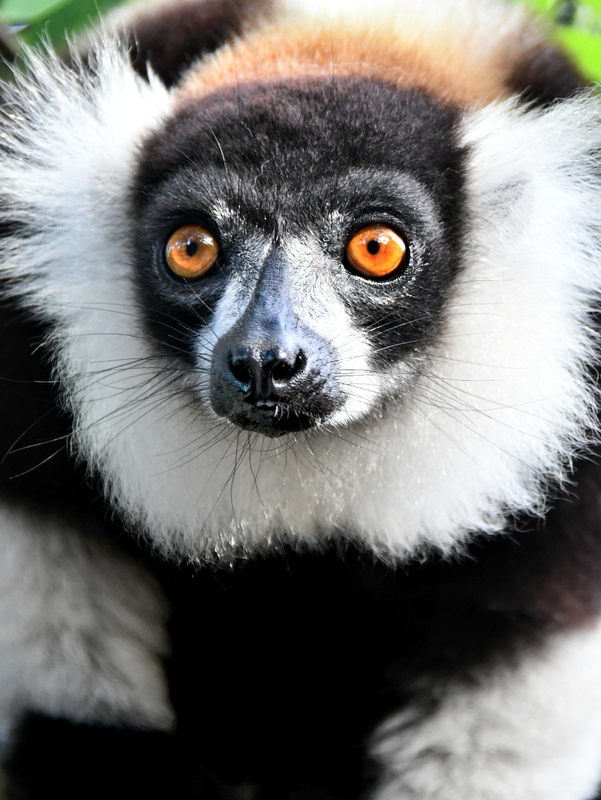 The call is one of the great sounds of the Madagascar forests. We had great looks at Zombitse and Mantadia in particular, and this was a trip favourite. MADAGASCAR BEE-EATER (Merops superciliosus) – Widespread in small numbers. BROAD-BILLED ROLLER (MADAGASCAR) (Eurystomus glaucurus glaucurus) – Likewise widespread in small numbers and with a great quacking call. This female Madagascar Sparrowhawk was seen near her nest at Parc Mosa. Photo by guide Phil Gregory. ELEONORA'S FALCON (Falco eleonorae) – One of the birds of the trip, this beauty was flying over the sea quite close inshore as we approached our boat at Chez Karon at Mahajunga. A very good find as they seem to winter more in the north and we rarely see them on the tour. SOOTY FALCON (Falco concolor) – Just a single at Tana airport, it gave good views both perched and in flight. 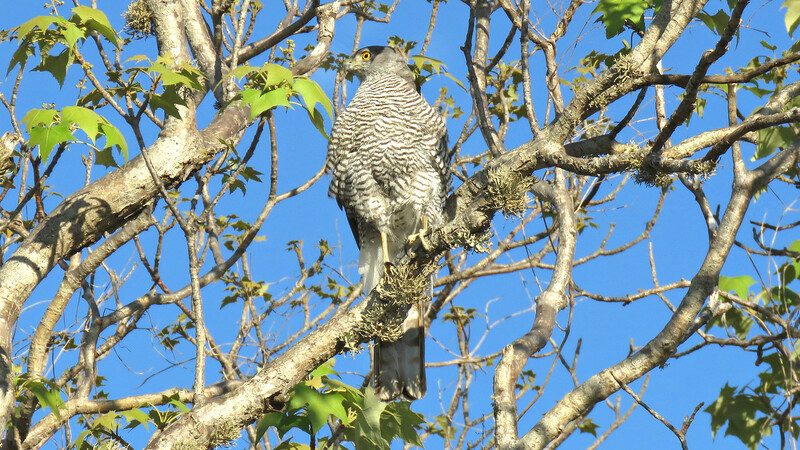 Linda and Mark also saw one at the Carlton Hotel; like Eleonora's Falcon it has a restricted breeding range and the few thousand pairs winter over a vast area of Madagascar and East Africa. Black-and-white Ruffed Lemurs showed nicely for us at Mantadia. This individual was photographed at the Palmarium Resort by participant Linda Nuttall. ECHO PARAKEET (Psittacula eques) – Lovely views from Bel Ombre with 5 of them near the feeding site, including several dark-billed females. CHABERT VANGA (CHABERT) (Leptopterus chabert chabert) – Nominate dark-tailed birds showed well at Andasibe, with a nest with chicks there, amazingly inconspicuous as it was so small and tucked away on a branch node at the Parc Villageois. The species was also seen at the Pangalanes. CHABERT VANGA (WHITE-TAILED) (Leptopterus chabert schistocercus) – This white-tailed taxon was seen at the spiny forest. 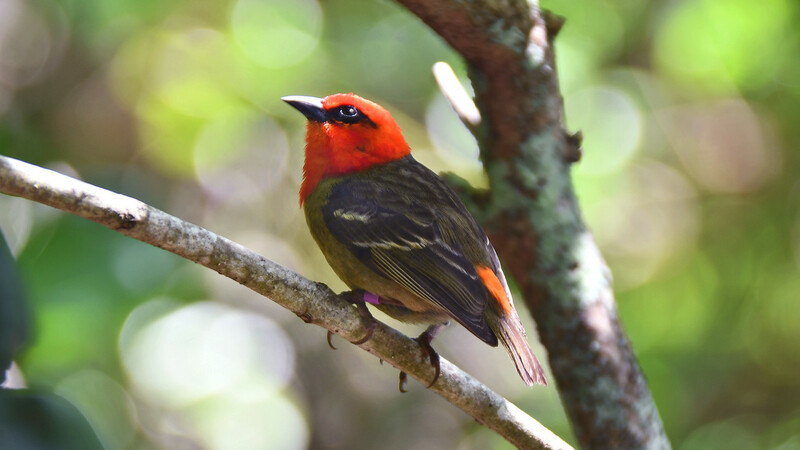 We saw this lovely male Mauritius Fody on our boat trip to Ile aux Aigrettes sanctuary, where there is an introduced colony of these rare birds. Photo by participant Linda Nuttall. Guide Phil Gregory got this video of a male Cuckoo Roller calling at Zombitse. This was another favorite bird of the trip for many! PIED CROW (Corvus albus) – A very smart-looking large crow, with a very raven-like flight style. It was fairly widespread in the open country around Madagascar, mostly during our drives. Despite the frequency of our sightings, the most we saw at any one time was 10. MASCARENE MARTIN (Phedina borbonica borbonica) – I think perhaps only Mark and Linda saw this race on Mauritius, where it is uncommon. PLAIN MARTIN (MADAGASCAR) (Riparia paludicola cowani) – An unusually good trip for them, we saw them in small numbers at Ambatofotsy marsh and then around Ranomafana, Isalo and Andasibe. This race is also a likely split from the African taxa, looking much paler bellied. MASCARENE MARTIN (Phedina borbonica madagascariensis) – The widespread and common swallow in Madagascar, we saw them at the airport then at the Tamboho in Tana, and continuing on to Ranomafana, Ampijoroa and Andasibe, where they look to be nesting in Perinet railway station. I think only Mark and Linda saw one on Mauritius where it is much scarcer. BARN SWALLOW (Hirundo rustica) – Two over the big reedbeds near the dry river at Tulear; it is rare in Madagascar but this region is now known to be a regular wintering site. This female Sub-desert Mesite was found in the spiny forest at Parc Mosa by our local guides; it sat very still, and did not move at all once it was found. Photo by guide Phil Gregory, who would like to see one do something other than blink! The Malagasy Kingfisher (also known as the Madagascar Kingfisher) was widespread on the tour. Photo by participant Marshall Dahl. Panther Chameleon was one of eight chameleon species we saw on the tour. Photo by participant Linda Nuttall. MADAGASCAR MAGPIE-ROBIN (BLACK-BELLIED) (Copsychus albospecularis albospecularis) – I am grateful to Linda for picking up on this one at Mantadia after I had mentioned it might be around but I'd not seen it yet. Interestingly this one had some whitish on the lower belly, and we saw the regular white-bellied taxon nearby here, so these two races do intergrade. One of my birds of the trip! MADAGASCAR MAGPIE-ROBIN (WHITE-BELLIED) (Copsychus albospecularis inexspectatus) – This white-bellied taxon has a black tail, we saw them at both Ranomafana and Andasibe. Anticipated to be split from the dry country one that has more white in the wings and tail. MADAGASCAR MAGPIE-ROBIN (WHITE-WINGED) (Copsychus albospecularis pica) – A couple of these white-bellied birds seen at Isalo, then commonly in the S and W, with the highest concentration being at Parc Mosa. This form has white in the tail and more white in the wings, and is a pending split. 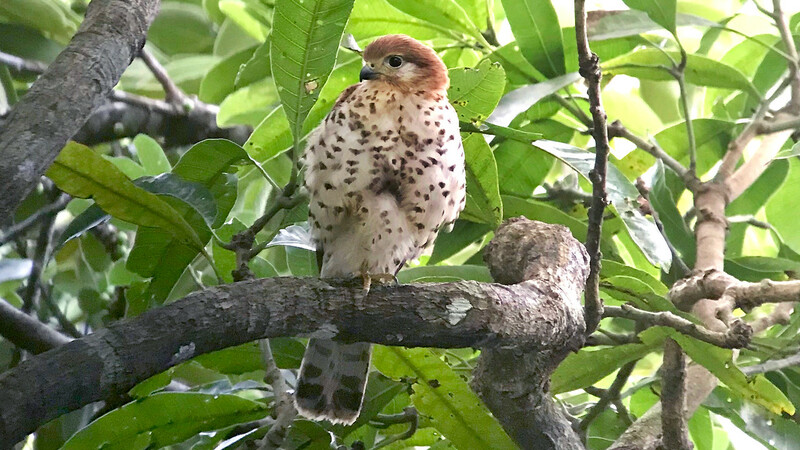 This demure female Mauritius Kestrel was one of a pair we saw near a nest-box at Bel Ombre. This is another species that has benefitted from conservation efforts. Photo by participant Marshall Dahl. VILLAGE WEAVER (SPOT-BACKED) (Ploceus cucullatus spilonotus) – Quite common on Mauritius, with several colonies seen on the way to the airport as well as at Flic en Flac and the picnic site. This is the southern African spot-backed black-faced taxon, which I anticipate will be split from the very different northern birds in due course. Here, our group poses at the Palmarium Beach Hotel. Participant Linda Nuttal took the photo, so she is not included. BROWN MOUSE LEMUR (Microcebus rufus) – One seen all too briefly at Ranomafana, where the Fat-tailed Dwarf-lemur was keeping it away. GOLDEN-BROWN MOUSE LEMUR (Microcebus ravelobensis) – A lovely look at this relatively recently described species on the night walk at Ankarafantsika. We were so lucky the storm just missed us here for the walk. We had a great look at this Red-bellied Lemur that Mark found at Mantadia. Photo by participant Linda Nuttall. FAT-TAILED DWARF LEMUR (Cheirogaleus medius) – Seen twice by the road at Ranomafana, but actually a bit of a nuisance as it kept the mouse-lemurs away! Also seen very nicely on the night walk at Ankarafantsika. COMMON BROWN LEMUR (Eulemur fulvus) – Seen nicely at Feon N'y Ala and then by the road at Andasibe. We also enjoyed the various tame lemurs at the Palmarium which came and sat on us. They have amazingly soft paw-pads, and are just so well-behaved, quite unlike monkeys. MONGOOSE LEMUR (Eulemur mongoz) – A lucky find on the night walk at Ankarafantsika, where we got to see 3 of this rare species. RED-BELLIED LEMUR (Eulemur rubriventer) – Mark found us a beauty sat curled in tree right by where we were standing to look for the Red-breasted Coua at Mantadia. RING-TAILED LEMUR (Lemur catta) – We went to a new site this year, and I was well impressed, the animals look healthy, far more so than the scabby looking ones at Berenty do, and they are there in good numbers. It is a village conservation area with local guides, so the money goes back to the community. They showed us about 60 of these wonderful animals and they have around 600 in the park. it is now classified as Critically Endangered with a total population > 5000 animals, all very sad. GOLDEN BAMBOO LEMUR (Hapalemur aureus) – Our first lemur was this very range restricted animal. This species was the impetus behind making Ranomafana a National Park, and we connected with one fairly atypically low and not far off the main trail on our very first morning there. BLACK-AND-WHITE RUFFED LEMUR (Varecia variegata) – Heard calling at Ranomafana but far away, then we were dead lucky at Mantadia, where we not only heard them but saw a group of 3 at close range, then two more later. Also a distant single on the second visit here. The locals call it the Panda Lemur and it is a very handsome species, one we seldom see. Check out the video on the Smugmug site. MILNE-EDWARDS' SPORTIVE LEMUR (Lepilemur edwardsi) – Fantastic at Ankarafantsika, where two were wedged into a hollow trunk and could be seen peering out at us from the crack. HUBBARD'S SPORTIVE LEMUR (Lepilemur hubbardorum) – This is called Zombitse Sportive Lemur by some, restricted just to the small remnant of transitional forest in this region. Our guides here did a fantastic job of finding one of these in a day roost very close to where we saw our Appert's Tetrakas. WESTERN WOOLLY LEMUR (Avahi occidentalis) – An endearing huddle of 3 of these at Ankarafantsika, peering down at us and like some Picasso-lemur as there seemed to be too many limbs emerging from the group. 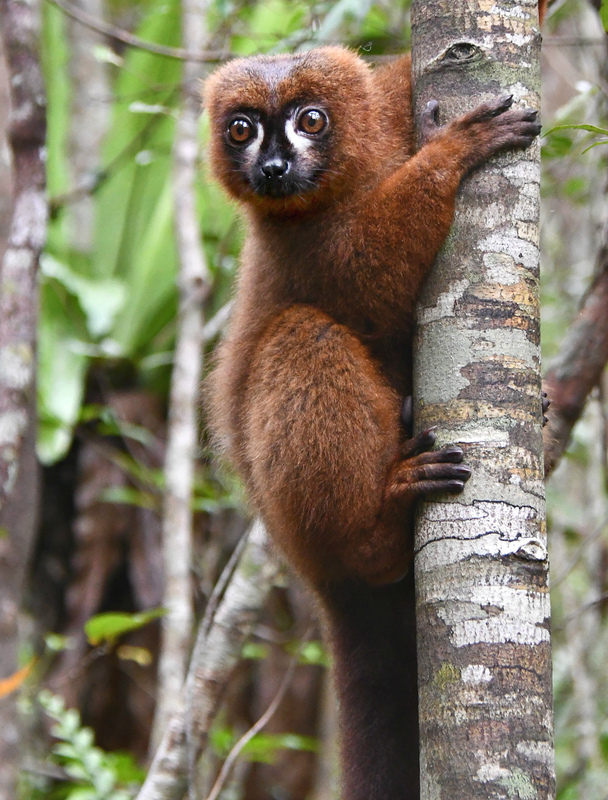 Our local guides call them "Oooli Lemurs" which at one time I took to be a newly described species until it dawned that this was the local version of "woolly!" VERREAUX'S SIFAKA (Propithecus verreauxi) – 5 at Zombitse showed well and were seen leaping from tree to tree, a spectacular lemur. COQUEREL'S SIFAKA (Propithecus coquereli) – Seen nicely at Ankarafantsika, and some endearing tame ones at Edena Kely in Mahajunga. DIADEMED SIFAKA (Propithecus diadema) – Several of them as we came down from Indri Ridge, one of the most colorful of the genus with orange furred legs, and quite a rare one. MILNE-EDWARDS' SIFAKA (Propithecus edwardsi) – Great views of 2 of these large dark sifakas at Ranomafana. INDRI (Indri indri) – One of the most evocative of all Madagascar sounds, and hearing them calling pre-dawn at Feon N'y Ala is just wonderful. They were very vocal at Mantadia too this time, but the only one we saw was a single animal on Indri Ridge. The largest of the extant lemurs, and lacks a tail. RED FOREST RAT (Nesomys rufus) – Mark saw one of these at Mantadia. LINED DAY GECKO (Phelsuma lineata) – Encountered around the hotel at Ranomafana a couple of times, and at Andasibe. STANDING'S DAY GECKO (Phelsuma standingi) – This good looking large Phelsuma was in the arid regions towards the southwest at the Bamboo Club, with a very large one on a wall there. 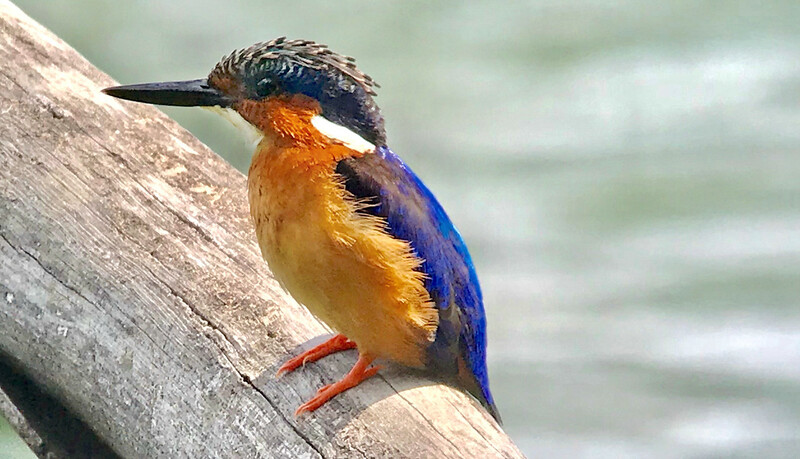 Madagascar Pygmy-Kingfisher was seen twice on the tour. This tiny bird was sitting on a vine at Andasibe where guide Phil Gregory shot this video. MAURITIUS DAY GECKO (Phelsuma cepediana) – A couple seen well on Ile aux Aigrettes, this is endemic to Mauritius. MALAGASY GIANT CHAMELEON (Furcifer oustaleti) – This large chameleon is known by most as Oustalet's Chameleon, we saw several of these over the course of the trip, the first on the ground walking at the Ambalavao Ring-tailed Lemur reserve. 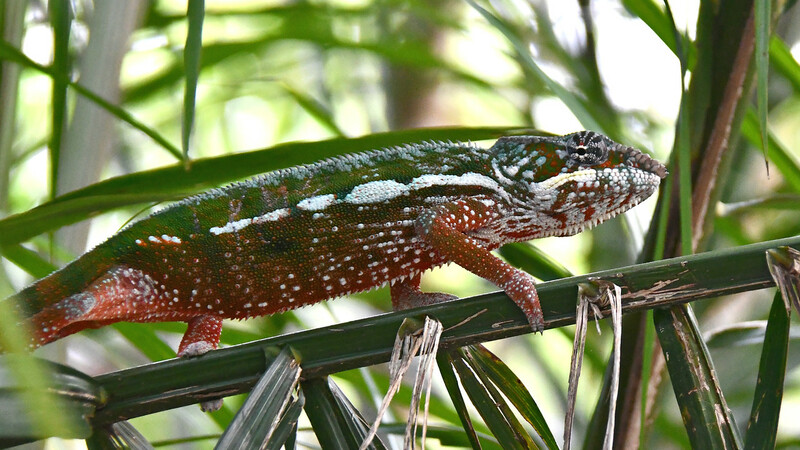 MADAGASCAR GIANT CHAMELEON (Furcifer verrucosus) – Better known as Warty Chameleon, we saw one very nicely at Ranomafana. HORNED LEAF CHAMELEON (Brookesia superciliaris) – One of these curious small chameleons showed well at Ranomafana. SHORT-HORNED CHAMELEON (Calumma brevicorne) – Two at Ranomafana and one from Andasibe. SHORT-NOSED CHAMELEON (Calumma nasuta) – One at Ranomafana, which was very good for chameleons this trip. PANTHER CHAMELEON (Calumma pardalis) – A single at the Palmarium was the final new chameleon for the trip. BLUE-LEGGED CHAMELEON (Calumma crypticum) – Two from Ranomafana. PARSON'S GIANT CHAMELEON (Calumma parsonii) – One striking colourful male was on a coffee tree at Ranomafana where it is shown to passing tourists, and we had one at Andasibe and one at the Palmarium. SATANIC LEAF-TAIL GECKO (Uroplatus phantasticus) – Great views of one of these extraordinary creatures at Ranomafana, always a very welcome addition to the trip. GIANT LEAF-TAIL GECKO (Uroplatus fimbriatus) – Nestor had one staked out at Andasibe, another extraordinarily well-camouflaged creature, I could spend the rest of my life here and not find one I'm sure. AFRICAN HOUSE GECKO (Hemidactylus mercatorius) – All over the restaurant walls at the hotel in Ranomafana, where they observed our dinner proceedings every night. We also saw them at various other of our establishments, often in the dining areas, but they were also sometimes our roommates. MADAGASCAR TREE BOA (Sanzinia madagascariensis) – A fine colorful specimen was coiled around a sapling at Ranomafana. MALAGASY GIANT HOGNOSE SNAKE (Leioheterodon madagascariensis) – Great views at Ankarafantsika where we had multiple encounters with these large and striking snakes which look absolutely ferocious but are non-venomous. COLLARED IGUANA (Oplurus cuvieri) – Great views from Ankarafantsika, a really distinctive species. GRANDIDIER'S MADAGASCAR SWIFT (LIZARD) (Oplurus grandidieri) – Quite common around Isalo. MADAGASCAR ZONOSAUR (Zonosaurus madagascariensis) – This was the skink-like lizard at the Palmarium. A very distinctive reptile, and it was also very obliging. BROAD-TAILED ZONOSAUR (Zonosaurus laticaudatus) – We encountered several big specimens of one of these broad-backed skink relatives during our late morning walk at Ankarafantsika. THREE-EYED LIZARD (Chalarodon madagascariensis) – Great looks at this distinctive lizard with a third "eye" in the center of the top of the head at Parc Mosa. NILE CROCODILE (Crocodylus niloticus) – A couple at the sacred lake at Ankarafantsika. Birds of the trip were a diverse assortment, with Red-tailed Tropicbird, Cuckoo-roller, White-breasted Mesite, Collared Nightjar, Malagasy Kingfisher and one of the ground-rollers all featuring well. As would be expected in such a unique location, there were many other creatures of interest encountered that aren't listed above. Here is a list of some of the ones we could pin down. Butterflies account for most of these, as there are reasonable references available to aid in their identification. I'd love to know the identity of the very large bright blue dragonfly with the green head that was patrolling up and down the creek at Feon N'y Ala.
Giraffe-necked Weevil (Trachelophorus giraffa)- We had our first at Ranomafana, and then saw a couple of more at Mantadia. Flatid Leaf Insect (Phromnea rosea)- We ran into the nymphs of these in two or three places along the way. They are truly bizarre creatures. We had Giant Pill Millipedes in several places. Assorted Satyrs, of several species.